The stars of Better Late Than Never, NBC’s new celebrity reality series, have had a lot of successes in their careers. But, how will this new summer series be a success in the ratings? Will it be back for a second season or cancelled instead? Stay tuned. 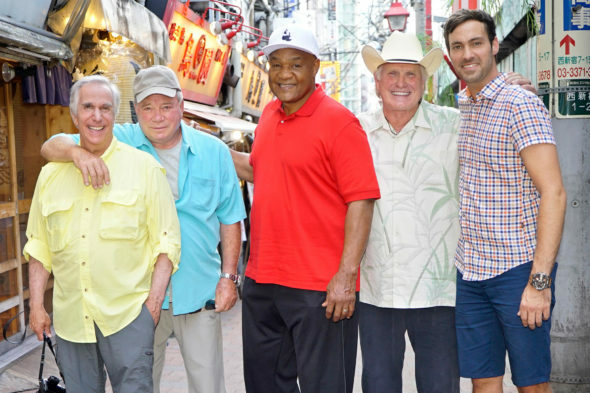 On Better Late Than Never, Henry Winkler, William Shatner, Terry Bradshaw and George Foreman embark on the journey of a lifetime, traveling across Asia on their own, with no schedule and no itinerary. The only help comes from Jeff Dye, a young tech-savvy comedian. He has an agenda of his own and he isn’t above leading the men off track. 9/22 update: NBC has renewed Better Late Than Never for a second season. Details here. What do you think? Do you like the Better Late Than Never TV series? Should it be cancelled or renewed for a second season? I have never laughed so hard! I have watched all gentlemen on their tv shows, football field and inthe ring! I love how Jeff Dye Brings them together and the laughs!!!! Please come back! All of you are great!! All ages love this show!!!!! A real comedy that keeps you cracking up! We hated to see it go off the air and sure hope it is coming back.A great diversion from all the craziness in our world, look forward to every episode! They were all perfect! Rolling in the floor funny. Spontaneous outbursts of “I can’t breathe” laughter!